Dr. Alice Langholt is a parent, author and teacher with Master level training in several Reiki modalities. She has a Ph.D. in Metaphysical Parapsychology. Alice is an adjunct professor at Montgomery College, and teaches classes in Reiki and intuitive development locally and by distance. She is the Executive Director of Reiki Awakening Academy Online School of Intuitive Development. Alice is the author of the Reiki resource, Practical Reiki: for balance, well-being, and vibrant health. A guide to a simple, revolutionary energy healing method, which won second place for Best Reiki Book in the 2012 About.com Reader’s Choice Awards, and was a Finalist in the Books of Excellence Awards in 2016. She has also authored The Practical Reiki Companion workbook, and many more books on self-care, poetry, and intuitive development. Alice is also a wedding officiant. Alice lives in the Washington, DC Metro area. In addition, she has authored specific curricula in Reiki for Parents, Reiki for Nurses and Caregivers (approved by the Ohio Board of Nurses for continuing education units), and more. Alice completed 100 hours in the Transdisciplinary Holistic Care Program at The Cleveland Clinic, and is a Group Leader with The Distance Healing Network (the-dhn.com). 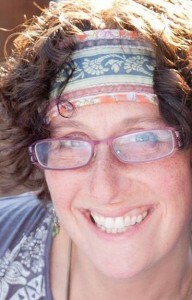 She taught Practical Reiki in Lily Dale, NY for two summers, and gives workshops at holistic expos around the US. Her husband, Evan, and their four kids know and use Reiki. As a teacher, Alice believes that close guidance and mentoring are essential elements for learning energy healing. She provides this support to each student, getting to know each and assist him or her in growing intuition and becoming confident practitioners. People often ask me how I got here, how I became a passionate Reiki teacher. Here’s the story, and links (underlined) to a number of blog posts written at the time of the events I’ve described here. Please enjoy. Now I’ve begun the Reiki Awakening Academy, bringing together some amazing people I’ve met along my journey, to share their skills and gifts with more people, as they did with me.